The Dean of the Chapel is The Rev'd Canon Mark Oakley. He has overall responsibility for the life of the Chapel and its community: For the conduct of worship, the work of the Choir and for the oversight of pastoral care within the College community. Mark is is the author of a number of publications (see below). Among other duties he is also responsible, as secretary to the Livings committee, for the presentation of clergy to 40 parishes in the Church of England with which the College has long historic connections. St John's College has two Deans, the Dean responsible for discipline is Professor Ernest Laue for more deatails please follow this link. His duties as Dean include the final responsibility of the conduct of the services in the College Chapel and oversight of pastoral care provided by the Chapel within the College community. 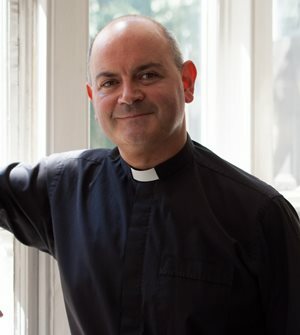 He is also responsible for the appointment of clergy to the College’s 39 livings (parishes) with which the College has long had official connections. Canon Oakley is the author of several books, the latest being The Splash of Words: Believing in Poetry. He is an Ambassador for StopHate UK, Patron of Tell MAMA (supporting those affected by anti-Muslim hate crime) and a Trustee of the Civil Liberties Trust. His interests include poetry, theatre and human rights.